The real facts of what espresso is, often surprises many people. First, technically, any coffee can be an espresso. There really are not specific espresso coffee beans. The word “espresso” simply refers to the way the coffee is prepared. Espresso is almost always a blend of beans. So it does make things a bit easier… and tastier, if you buy beans labeled for espresso. The most basic rule of espresso blending is that espresso must have subdued acidity, be heavy bodied, and be sweet enough to balance the bitter and acidic flavors in the blend. In general, espresso is prepared using a much finer grind than what would be used to prepare drip coffee. A small amount of hot water is forced through finely ground coffee, resulting in an espresso, which is smaller and more viscous than a regular cup of coffee. When a shot of espresso is pulled, all of the components of the crushed coffee beans are extracted by the percolation of hot water through tightly packed and finely ground coffee. 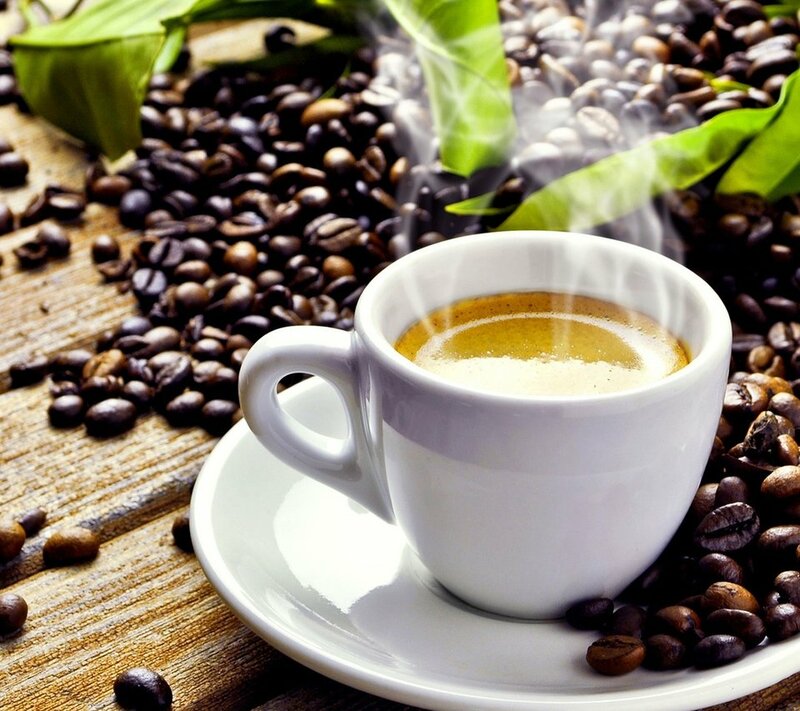 The pressurized water extracts soluble and insoluble solids and oils found in the coffee beans and deposits them in the cup. There are two layers to a shot of espresso — the crema (made up of carbon dioxide bubbles surrounded by water and oils) and the liquid (made up of soluble solids, gases and insoluble solids). Compared to regular, drip-brewed coffee, espresso is heavy-bodied, aromatic and slightly bittersweet. Espresso does not have more caffeine than drip coffee. In fact, drip coffee has more caffeine than espresso and in some cases much more. A typical cup of drip coffee (the National Coffee Association says it’s 8 oz.) contains around 80 milligrams of caffeine (accounting for factors such as roast level, extraction percentage, and others). A two or three ounce shot of espresso yields around 70 milligrams of caffeine. Those figures are pretty close of course to a traditional cup of joe, but how often do we just drink eight ounces of drip coffee? Just about never. More often than not, we’ll down twelve, sixteen, and even twenty four ounces of coffee at a time through out the day. Espresso, since it’s such a concentrated beverage, actually does have more caffeine per ounce. But when was the last time you slurped only two ounces of drip coffee? Another tidbit that relates to espresso or that traditional cup of drip or pour-over coffee, is the myth that darker roasts have more caffeine. This largely comes from people mistakenly associating caffeine levels with bold flavor. The bold flavors of dark roasts are thought to be stronger, and therefore, contain more caffeine. However, caffeine isn’t what produces the bolder flavors — that comes from the roasting process. So, the lighter the roast, the more the caffeine — as it hasn’t been roasted off the bean. More recently introduced was Pellini Cremoso and Tradizionale. Pellini Cremoso is a medium roast espresso with a rich aroma and strong flavor. The blend of Pellini Cremoso creates a balanced and well-rounded espresso. Pellini Tradizionale is a vigorous coffee that is full of character with an intense flavor and classic aroma.